Google often changes its algorithms and updates to ensure user friendly service for its web surfers. Now Google is releasing mobile friendly labels which will determine if the website is mobile friendly before even visiting it. Statistics show that 72% of users say a mobile-friendly site is important to them, because it improves search results and experience. So what are the main advantages of responsive web design to your customers? Content adjusts to mobile screen size. No horizontal scrolling or zooming. Links spaced for east tapping. Improve your business and marketing techniques by handling mobile traffic in a new way. 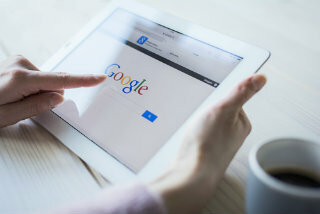 A huge proportion of traffic is coming from mobile devices so choose to improve your SEO strategy the Google way. The new update will come out on the 21st of April, so make sure your website is mobile ready before the date. Did you know that all Kommand.me website templates are already mobile friendly? All you need to do is add your content, pictures and videos to make your website live! If you already have a website, but it is not performing well contact our team and we will help you to rebrand your business. Be Google ready and make sure your website is ranking higher than your competition. Consistent responsive website design gives website owners and content publishers a way forward, a chance to consolidate pages and offer digital content in a new way. Create and improve your complete mobile site. Let mobile analytics and mobile marketing be a part of your mix. Utilise responsive web design and ensure new markets are open and all opportunities for online business taken. Responsive web design encourages the growth of mobile marketing. A mobile-friendly website is essential if SEO is a part of your marketing strategy. The importance of mobile-friendly websites increases with the growth in smartphone use. Make a change, utilise specific web design expertise and adopt a mobile friendly website. Google recommends adding responsive web design to your search engine optimization strategy 2015. A responsive website will provide better user experience across various screen sizes and device types. Responsive web design allows one website to provide a great user-experience across many devices and screen sizes, and it also makes managing SEO strategy easier.